hook 36890-#8 Mustad Limerick hook with upturned eye, black. under body Peacock color cactus chenille (made of mylar), 7 turns. rubber legs 5-1/2" long pre-cut rubber leg material with color variations (black, gray, & green) cut into 4 equal lengths. over body Black Foam, approximately 1/8" thick, 1-1/2" long, 3/16" to 1/4" wide with back end cut to a point. indicator Red or orange foam, 1/8" thick, 3/16" wide, 3/8" long. While fishing Frenchman Lake in October with David Harris, I happened to get out of the water to get a little warmer. David did as well, and while he was close to shore in 1-1/2' of water, he decided to start throwing a black beetle pattern he happen to have in his box. After he caught three fish with the pattern, I asked him if he had any others that I might try. He didn't have any extras, but he suggested I use his only fly because he knew how much I liked to fish big flies on the surface of lakes for big fish. I used that single fly for the next few hours and caught many nice fish and missed a lot of big strikes. The indicator on the back of the beetle sure made it easy to locate out on the water, as black flies by themselves quickly disappear on the lake surface. I like to work this bug on the surface creating a "heck" of a disturbance. A 6" to 12" quick strip creates a popper action. The upturned-eye hook is my idea to create a perfect platform for the front of the foam body. 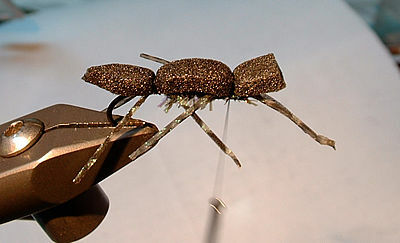 Next time you are on a lake and you want a change of pace from throwing a wooly bugger on a sinking line, switch to a floating line and try creating a disturbance on the surface with a beetle. You'll be surprised at the size of the fish that will come charging after it. First step is to tie in an under-body. 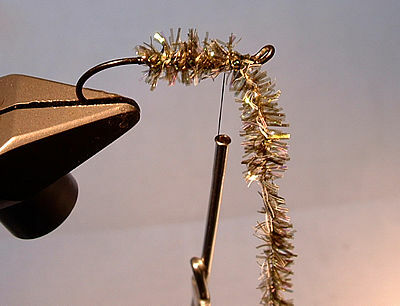 Start with the chenille tied in right above the barb of the hook. Wrap the chenille 7 times forward. Take one length of rubber leg material, 5-1/2" long, doubling it over and cutting it into two equal lengths. Then cut each of the resulting 2-3/4" pieces into 2 equal lengths for a total of 4 pieces. 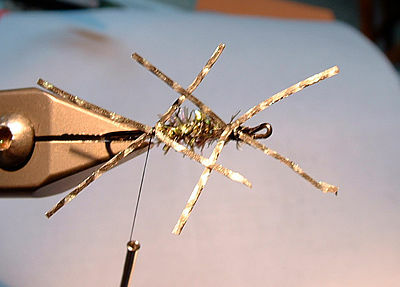 Tie in 2 of the leg segments at the top of the hook at the front of the underbody in a X pattern. It took me a while to hone the technique so that the legs come out right. The key is to make two light wraps of thread over each leg segment, then straightening the leg before going further. Once the front legs are tied down then take 2 or 3 wraps of thread over the body to the spot at the back of the body where you started. Tie in the other 2 leg segments in an X pattern. 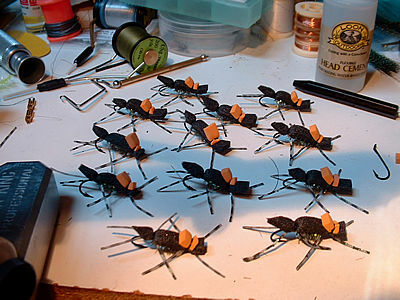 With the thread now over the center of the rear X of rubber legs, tie in the pointed segment of the foam body, approximately 3/8" of the body, with about 10 wraps of thread at that one spot. Now lift the remaining foam body and take 3 wraps of thread forward being careful not to tie down the rubber legs. Come to the center of the X formed by the front set of rubber legs. At this point you now tie down the foam body with at least 6 wraps of thread. 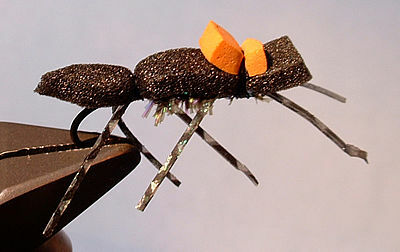 Take one of the small foam Indicators and wrap it in at the front of the fly right over where you tied in the front portion of the foam body. Hold the indicator so that the thread wraps come at one spot 1/3 back from the front of the indicator. As you tighten these final wraps the back 2/3 of the indicator will get pushed up making more easy to see when out on the water. Finish off the fly by tying in at least 6 half-hitch knots so that they go over the eye of the hook and down to your thread wraps. Use the half-hitch end of your bodkin to guide these knots over the hook eye. Put on some good thin head cement. I cover the entire over-body wrapped thread around the front of the fly as well as around the thread at the rear of the fly. Big trout can tear up your flies in short order, so don't slack on the use of head cement. This beetle is a good pattern for black bass, with proven results at Roberston's Pond east of Oakdale, and at Ruker Lake, west of Emigrant Gap on Bowman Lake Road. Last year in July, I fished from 12:30 PM to 4:30 PM on Ruker Lake and caught 65 bass up to 16" using only this pattern. However, I had to use 5 of the flies because the bass really chewed them up. The best places to target was around the edges. Good luck with this pattern, especially if you get to Frenchman Lake in the fall. Tight lines!